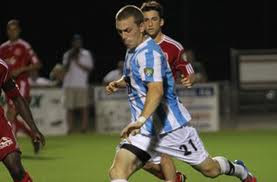 Corey Hertzog is a New York red bull striker who is on loan down to the Wilmington Hammerheads. 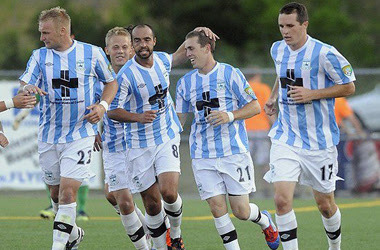 Corey was loaned to the Wilmington Hammerheads at the end of May. His loan was extended at the end of June through the end of the USL pro season. Hertzog is from reading the Pennsylvania. He attended Penn State University from 2008-2010. In 2010 he was the NCAA scoring leader. This grabbed the attention of the New York Red Bulls who drafted Hertzog, in the 1st Round of the MLS Super Draft (13th Overall). Pedro Gomes: Let’s get to know a little bit about you and a curse and can you tell us what it was like growing up playing soccer in southeast Pennsylvania. A place where lots of top players have come from including Ben Olsen. Corey Hertzog: Yeah, I grew up playing under my Dad, all the way up to College. He was my coach at my first city team out there. In college I played PDL with Reading United a couple of years. Pedro Gomes: I noticed you have a very close relationship with your Dad. I noticed you Tweet a lot about him. Corey Hertzog: Yeah, my Dad has been coaching me since I was 3. He’s the reason I am at where I am today, so I have a lot of respect for my Dad. Pedro Gomes: So can you talk about your time at Red Bull, getting drafted and your overall Rookie experience last year? Corey Hertzog: Yeah, It’s always a kid’s dream to get drafted in the MLS and the same was true for me. I was really excited, especially to go to New York because it’s close to home and I get to play with one of the best players ever, Thierry Henry. It was a really good experience for me last year, practicing with Thierry Henry, I learned a lot getting to watch him play a lot of games. Practices were great and I learned a lot. Pedro Gomes: To get your perspective, what was it like coming out of College, being a Generation Adidas guy, winning the scoring title in the NCAA and then having to be a Rookie and having to fight for playing time on a professional team? Corey Hertzog: Yeah, it was something I had to get used to, especially growing up in a small town, playing for my dad and it was something to get used to but I think I learned a lot more with that experience. Going to practice every day and working hard and just trying to get a spot on the 18 and then eventually hopefully the starting 11. Pedro Gomes: So you have been struggling to get playing time because of all the guys you have mentioned, playing behind Thierry Henry and Kenny Cooper and the sorts. So can you just tell us what went through your mind when you found out you were being loaned to Wilmington? Were you excited? What did you think? Corey Hertzog: Yeah, every player wants to play games and not just practice so I was really excited to go down to a team where I could play and try and showcase what I can do. Playing down here has been a great experience for me down here in Wilmington. Pedro Gomes: Can you go over your experience so far, did the team welcome you? It looks like the coach put you straight in. You got loaned at the end of May and started playing almost immediately, right? Corey Hertzog: yeah I mean I got down here and I gelled well with the guys and the guys were really great down here. Coach talked to me when I first got down here and told me I was going to play the last 20 or 30 minutes of the game, and I thought I did pretty well and the next week he said I was going to start against Orlando and I think it was one of my best games, and I felt like I gelled well with all the players and tried to help them as much as possible to get to the Championship. Pedro Gomes: You say you gelled well with some of the players, you knew some of the players down there like, Tyler Lassiter and Alex Horwath, who were on the Red Bull Roster last season, right? Corey Hertzog: Yeah uh, it was funny because Alex was texting me in March and May, just text me like, It would be awesome if you could get loaned down here and get some playing time,” and from there one day I just got the call and I was off to Wilmington and Alex was the first person I called and I told him I would see him Saturday for the game. So it was really exciting. Pedro Gomes: Yeah its good to have those types of connections to help you gel right in. You know I follow you guys on Twitter and I think you guys started the hashtag #NightHawks. Can you talk about what the Nighthawks are? Corey Hertzog: That comes from the Reserve team from last year and a bunch of us like 8 or 9 of us and Petke was our coach. We just gelled together really well and we lived in the same area and got along and we just came up with it one day and I think it was up in New England on the reserve team. We were just sitting on the bus to the game and we just came up with The Night Hawks as our team name. I’m actually wearing the shirt right now. Pedro Gomes: You guys have T-Shirts made, huh? Corey Hertzog: Yeah we have T-Shirts that just say Night Hawks in the front. Pedro Gomes: That’s awesome. So let’s talk about what you’ve done at Wilmington. Your play has definitely turned this team around when you first got there in late May. When you first got there the team was in 7th place. And you started battling back and you clinched the 5th Playoff spot in the final regular season game against Charlotte, a game in which you scored. Then last Saturday, your Brace led the team into the Championship, upsetting the number 1 ranked team in the Playoffs. So why do you think you have fit in so well and excelled so well with Wilmington? 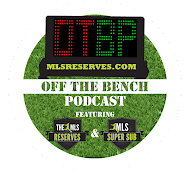 Corey Hertzog: I think it was one of those types to come to in the USL, just the way we play and the way we get along with each other just fit my type of style. I have great players, we have great players in mid-field and in goal and a lot of credit goes to them. Pedro Gomes: Well because of your great play, I am sure you are aware that you have been recently named to the USL Pro All League First Team as well as one of three finalists for the USL Pro MVP. How do you feel about that. Corey Hertzog: yeah it was a great accomplishment. It shows what I can do on the field. But the only thing I am thinking about right now is this Championship on Saturday. Pedro Gomes: What are your thoughts on the upcoming Championship Game? How are you preparing for it, are you changing your game plan, or are you going to go in there with a different mentality? Corey Hertzog: No we’re going to go in there with the same mentality as we did against Orlando. We need to start pressuring and go at them I didn’t think Orlando was ready for that and we played our game plan perfectly. Pedro Gomes: I’m pretty sure they will be looking out for you because you only played 17 games this season in USL and you finished 2nd in Total Points Leaders with 23 points as well as finishing with 9 goals and 5 assists. Do you think they are going to be looking at you as the number 1 offensive threat for Wilmington? Corey Hertzog: I mean, I think so but we have a lot of great players that play off me like Luke Holmes, who stepped up and scored a goal against Orlando and then we have Hagop Chirishian that scored against Richmond and Orlando. So we have a lot of offensive power, it’s not just one player it’s a couple of players stepping up at the right time. Pedro Gomes: If people are wondering why we might have a bad connection, It’s because you are actually on your way down to South Carolina to get ready for the Championship Game on Saturday. Corey Hertzog: Yeah, we’re traveling down right now on our way to Charleston. Pedro Gomes: So what do you know about Charleston? What do you think is going to be your biggest challenge in that game both personally and as well as the team? Corey Hertzog: I think our biggest challenge is coming into the game…like we know it’s the Championship game and we don’t want to come in too excited and too nervous and don’t want make mistakes. We need to play like we have for the last two games and I think that’s going to be our biggest challenge. Pedro Gomes: You guys must be feeling confident, right, having knocked out Orlando City who had dominated the league in the regular season and you actually knocked out another former , Night Hawk, by the name of John Rooney. Does that build your confidence as a team and as an individual heading into this Championship? Corey Hertzog: Yeah, it always feels good knocking out the number 1 team in any playoff or regular season, so our confidence is very high right now. I feel like we are going to need to chop down a little bit and get ready for Saturday. We can’t go into the game too confident and something could happen like what we did to Orlando, so we don’t want to be too confident. Pedro Gomes: We wish you the best. How are you going to take this experience and just come into Red Bull camp and get back into practice and be fired up? What are your goals when you get back to the Red Bulls? Corey Hertzog: This experience has really helped my confidence Hopefully, I can go back to the Red Bulls and score some goals and eventually get on the bench and score some goals for New York and help them try and win the MLS Cup. Pedro Gomes: So now for a quick personal question. I have a younger brother who goes to Penn State and if we have any Penn State Alumni or Students listening or reading, what is it about Penn State that you miss the most? What’s the one thing you wish you could still do at Penn State? Corey Hertzog: Just hanging out with all of my old friends and the Soccer Team. I spent most weekends with them like getting ready for games, and playing games. Just really hanging out with the guys and I wish we could just have more contact with them. Pedro Gomes: Alright well that about wraps it up. I just wanted to thank you for coming on. I know you have a lot to do especially getting ready for the Championship game on Saturday. For the people who are interested, the game will be on Saturday at 7:30 PM and it will be streamed on USLnation.com and it will be the #5 Wilmington Hammerheads, who Corey plays for, and the #3 Charleston Battery. So best of luck and we really appreciate your time. Every second and third division team should be on alert now that Hertzog has been cut. Maybe he'll tryout during preseason training with the Red Bulls, but if he doesn't re-sign with them (or get picked up by another MLS side), he could be an immediate impact player in USL or NASL in 2013.